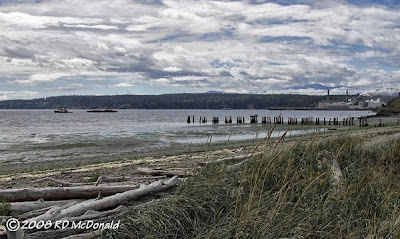 Port Townsend, August 28, 2008. What a difference a week makes! Top view is of the Milwaukee Road rail bridge wye trestle taken a week ago today - August 21, 2008. 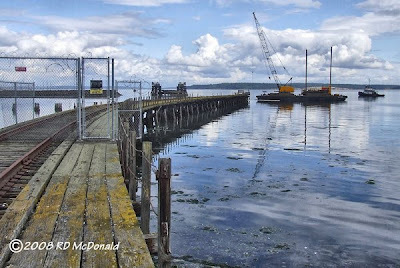 Looking south, this is all that is left of the trestle, just beyond the reach of the barge-mounted crane at high tide. 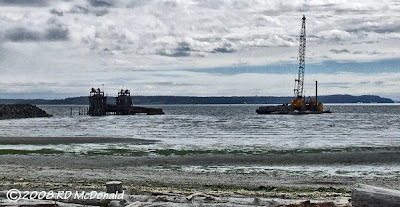 In the background is the final decking from the trestle being towed out of the bay, with Port Townsend Paper mill in the distance. The rail bridge structure is next! See for details as to what is happening here. Port Townsend, August 21, 2008. Work began today as part of an ambitious initiative “pulling piles” on the old Milwaukee Road trestle. The purpose of this initiative, proposed in 2002, is to remove creosoted pilings, which are slowly but continually leaching harmful chemicals into the Puget Sound. 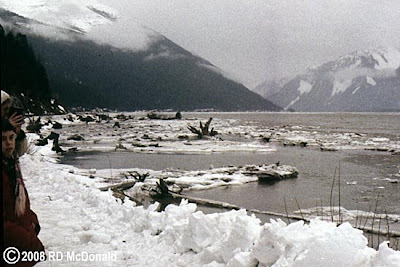 This chemical release has been contributing to the overall degradation of water quality, naturally affecting the critters that live in this magnificent waterway, for many years. An enthusiastic partner in this reclamation program, the Washington State Ferry system – largest ferry system in the USA, laid out their plan for replacing numerous structures including wingwalls, pilings and dolphins at all their ferry terminals on the Puget Sound. The total number of pilings within the ferry system alone is staggering! In addition to the State Ferry System, dozens of communities are slowly but surely removing pilings and other decaying structures within their respective jurisdictions. 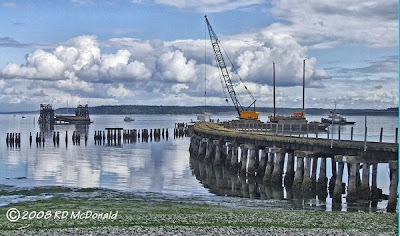 As an example, just last year, the Point Hudson Marina here in Port Townsend was completely stripped of all piles, and a new marina emerged featuring concrete piles and floats. You will see in this document, that water turbidity created by piling removal and protection of wildlife is a serious consideration. Other sites in “my back yard” include the “PT RR Trestle –Site 3” removing the rail bridge, and “wye” shaped trestle, last operated as part of the 14th Subdivision of the Milwaukee Road. 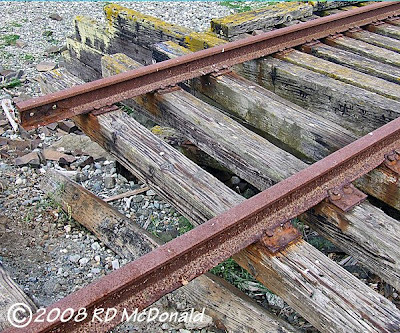 I wrote a brief history of railroading here in Port Townsend, “In my own back yard!” which is consistently ranked in the Top Ten reads for this blog. I invite you to grab a cup of coffee, and immerse yourself in some interesting history! Cowlitz, Chehalis & Cascade #15, Chehalis Washington, June 10, 1962. Located just a few blocks off the I-5, we found this beautifully restored Mikado proudly on display – with a story with a different ending! Originally built in 1917 for the Clear Lake Lumber Company, she was delivered marked as Puget Sound & Cascade 200. Uhm. 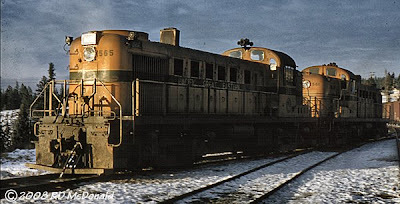 Repossessed by Baldwin, she was re-sold to Cowlitz, Chehalis & Cascade as #15. Not much was known about this operation, but this article lays out the basics. 1917 – 1956. Here rests the “Old Lady” steam locomotive No. 15 built by the Baldwin Co. in 1917 – Mikado type 2-8-2 = Straight top boiler, Walchaert type valve gear – super heater engine(s) – Weight nearly 100 tons. Cowlitz, Chehalis & Cascade Railway ‘no 15’ pulled thousands of logs to this area for nearly 27 years along its 32 mile route, making lumber one of our great major industries. This museum piece placed here by our community for future generations. 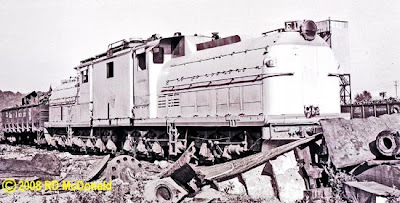 Her remarkable condition lead to her being “salvaged,” rejuvenated, and placed back in revenue service on the Chehalis – Centralia Railroad & Museum! Pacific Great Eastern 593, North Vancouver, July 3,1961. It's the 4th of July weekend, and my sound recording buddy - El Purington and I - have ventured north to capture the variety of rail experiences with the Pacific Great Eastern, Canadian National Railways and Canadian Pacific Railway, in and around Vancouver. 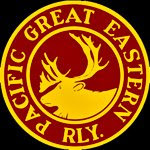 Pacific Great Eastern's North Vancouver facility is in several "location shots" seen in the "X-Files" television series. Indeed, one of the Budd RDC's was demolished in a blast in one of the programs! Years ago, an article in "Trains" magazine ran a featured story entitled the "PGE Roller-Coaster!" in describing the south-north profile from North Van to the Peace River Country! For those of you brought up listening to the zero-personality of modern day high-speed diesel engines, here is a very short YouTube video that gives you some idea as to how these hypnotizing units sounded. Now that motor has "character!" It's a little known fact amongst rail buffs that once upon a time, ALCo made four wheeled automobiles! The company diversified into the automobile business in 1906, producing French Berliet designs under license. Production was located at ALCo's Rhode Island Locomotive Works. Two years later, the Berliet license was abandoned, and the company began to produce its own designs instead. Alco cars won the Vanderbilt Cup in both 1909 and 1910 and also competed in the Indianapolis 500-Mile Race in 1911, but they had less success in sales, abandoning automobile manufacture in 1913. 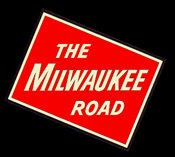 The Alco automobile story is chiefly notable for starting the automobile career of Walter P. Chrysler, the plant manager, who left for Buick in 1911 and subsequently founded the Chrysler automobile giant. Montreal Locomotive Works, under licence to ALCo, permitted side stepping of "import" taxes, building to the DL 718 specifications. 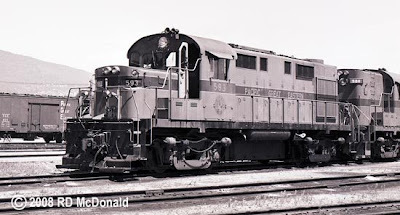 Railroad Stuff: Pacific Great Eastern 593, built by Montreal Locomotive Works as the Canadian Version of the American DL718. 1,800 hp 4-cycle 251B V-12. Built in September 1960, sn 83276, renumbered PGE 607 in 1964, BC Rail 607 in 1972. Milwaukee Road EP-2, Seattle, August 26, 1961. I have just graduated from high school, and working at Bethlehem Steel in the Nut House, making good money to enter Washington State University next month. Whilst making my “rounds” for the last time prior to moving to Pullman, I tripped over this Bipolar in her final agonizing hours at a scrap yard on the Duwamish waterway. What a sad sight – one can only remember her beautiful color scheme on the head end of the “Olympian,” designed to work the Cascade and Saddle Mountains. 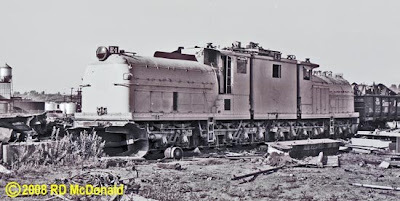 These were unique electric locomotives in that the armatures were mounted on the axles, and two field poles, 180° apart, were mounted on the locomotive chassis. This resulted in zero wheel slip at throttle-up, and there was no horsepower lost in “gear trains.” And they lacked the growling gear sounds of the Box Cabs, and no traction motor whine. With a top speed of 458 RPM, the only noise they made was the bell and the horn! The concept of the bipolar design - also known as the "s" motor, can be traced back to the 1890's, in English deep tube applications, as presented in this historical presentation. The drive concept was original, but it did have flaws that made it a unique electric motor system not repeated. 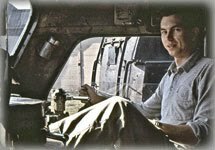 The EP-2’s 12 - 1,000 volt traction motors, controlled by a 26 notch throttle, ran in SERIES, 250 volts to each motor, SERIES-PARALLEL, 2 groups of 6 motors in series, with 500 volts to each motor, LOW SPEED PARALLEL, 3 groups of 4 motors in series, 750 volts to each motor, and HIGH SPEED PARALLEL, with 4 groups of 3 motors in series, 1,000 volts to each motor. At start up, a locomotive could deliver 123,500 pounds of tractive effort, requiring up to 6,000 amps, with running speed around 800 amps. 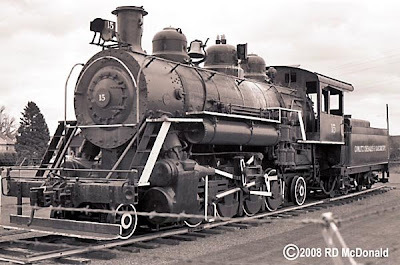 The locomotive consisted of three articulated segments, with the center section containing an oil fired boiler and water supply for passenger car steam heating. From what I understand, the fireman spent considerable time on the road fiddling with this unit! Designed to run as a single unit, this was the power pack for the “Olympian” from 1919 through 1960! I cannot recall seeing these units running, as my “rail” outings were confined to weekends, and it would have taken a deliberate outing to stake out the Milwaukee’s passenger movements. How naive I was in those days! Attempts to increase speed by tweaking the traction motors in the 1950’s, resulted in an onslaught of electrical problems that eventually lead to their demise. Only one unit of the five, E-2, was saved and is on display at the Museum of Transportation in St Louis. Railroad Stuff: Chicago, Milwaukee, St Paul and Pacific E-1. Built by General Electric/ALCo, January 27, 1920. Original number was 10250, renumbered to E-1 in March 1939. 3,200 horsepower. Scrapped in September 1961. Canadian National Railways 55361, Prince Rupert, March 3, 1958. A fine looking piece of machinery – painted jet black, with red trim around windows and doors, and of course, a bright red rotary assembly. She’s all decked out with nowhere to go! Notice the extra water tank and tool car. Extra water was required as most of the water tanks were torn down with the advent of diesels takeover. And, she’s lined up ready to respond, with two geeps and a caboose completing the consist. Prince Rupert does get some snow, with heavier showers sticking around for a few days, but being right on the North Pacific Coast, nothing requiring a rotary plow. However, just a few miles up the line; winter gets serious, with the Skeena River freezing over, and heavier snow as the line carves though the Coast Range Mountains. In the three years we lived in Prince Rupert, I can only recall two or three times this machinery was activated. As I have mentioned before, our house was just a short distance from the Main Line, and from my second floor bedroom, I could watch departures and arrivals. One evening, I heard the most god-awful moaning air horn, accompanied by a “chunkety-chunkety” rumbling sound. I rushed to my outpost, and observed the 55361, three massive headlamps piercing the darkness, being pushed east by a pair of Geeps. Oh, what a moaning air horn she had! 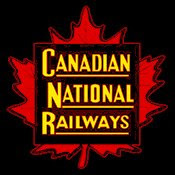 CNR 55361 is now on display at the ExpoRail Canadian Railway Museum at Delson, Quebec. 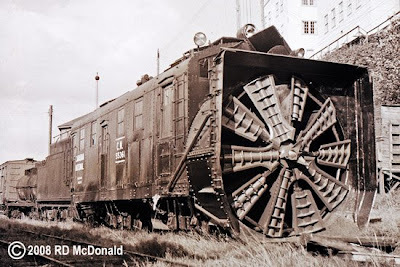 Railroad Stuff: Canadian National Railways Rotary Plow 55361, built by Montreal Locomotive Works, December 1928, sn 67650.